To purchase a James Villas holiday gift voucher, give one of our Travel Advisers a call on 0800 074 0122 and simply choose your amount between £1 and £9999. Do you know a happy couple that would be even happier if you helped make their dream villa a honeymoon reality? Or perhaps there’s a big anniversary that would feel even more epic with a private pool and plenty of sun, a holiday gift voucher could be just the ticket. Maybe you’re just stuck for that Mother’s Day or Father’s Day gift? Give us a call and help a friend or loved one unwrap the gift of a villa holiday with one of our holiday gift vouchers. Your James Villas gift voucher will be emailed to you, so you can forward it onto the lucky recipient or wrap it up however you like for when that special day comes. And they’ll have two years to use it, because there just shouldn’t be any rush on finding their perfect holiday. 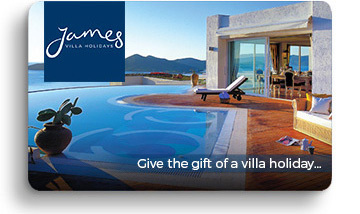 Gift vouchers can be redeemed as full or partial payment against any holiday booking with James Villa Holidays. All vouchers must be used in full and no change or voucher credit can be issued. Gift vouchers can be redeemed for a period of 2 years following the date of issue. Gift vouchers are not redeemable for cash, cannot be resold, cancelled or exchanged for refund. Gift vouchers can only be redeemed towards holidays where the voucher holder is travelling. Holiday deposits cannot be paid using gift vouchers. If the full cost of a holiday is due at the time of booking (if booked within 14 weeks of travel), the gift voucher amount will be deducted from the total holiday cost. If it becomes necessary to cancel a booking where a gift voucher has been used as full or partial payment, any refund due will be in the form of a gift voucher up to the original gift voucher value. Normal cancellation terms apply in accordance with James Villa Holidays booking conditions. Gift vouchers are sent via email as e-vouchers. Please therefore ensure that you have entered the correct email address and ensure the recipient checks his or her spam folder. James Villa Holidays accepts no responsibility to provide a replacement or refund should the gift voucher be lost or stolen. James Villa Holidays reserves the right to vary these terms and conditions. The usual booking conditions will apply to all holiday bookings made with James Villa Holidays.